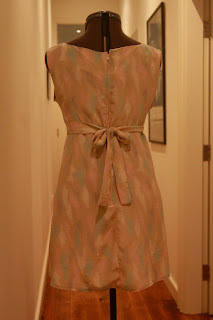 Veronica Darling: Dress 27: Pastels! Hey darlings. I've been a bit busy AGAIN but ticking off a few things here and there. TICK! Mostly my day job happenings... big TICK as the year winds up. There's only 3 major weeks left and then I won't know what's hit me. Today proved that I can be productive with white wine. VERY productive! Why did I stop drinking in October then? I should have kept at it, been a fatty boom bah and screamed through my Frocks for the Frocktober Challenge. Anyways, happy to report this frocko turned out quite well! Sorry for the inside shots, but it's late and husbie is out at a work function. But it seriously does look really pretty on, and it's the weirdest mix of pastel 80s colours, that just works! But I'm rather proud of my construction (although these pictures highlight the snags and rumpled bits I'm afraid) because I taught myself about lining. Friends, I'll be honest. I cut corners. 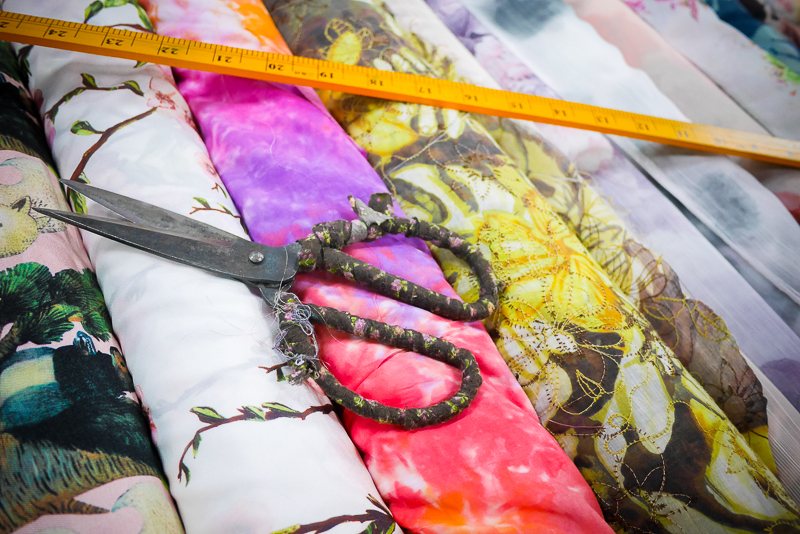 I only have stash fabric, and rarely go to the 'real' shops for material and haberdash. Even the other day in the op shop, the shopkeeper was insisting I take whites and light cottons that she'd got and I was like 'why?' and she was LINING DARLING, LINING. Even if you just line the bust bit or whatever. So it's with strange delight I announce that for the first and proper time, I've made up some lining, that's not only the bust bit, but the ENTIRE FREAKING DRESS. And it was only because this fabric was slightly sheer. So I'm heaps proud, of course, but I can't even begin to explain how I did it. I think I worked it out halfway through construction that the fabric was a bit see through. Then I decided that I'd make it for myself, so used a white fabric from some holiday trip. I think it was supposed to be a sari. But it was really light and flowy like the dress material. 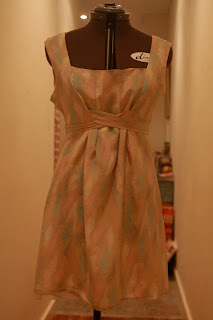 Then I put together the whole thing, but didn't sew any side seams or armhole bits. And then I roughly measured out the bodice bit (it has gathers/darts/tucks you see) and then attached the lining to the neckline first, ironed it all flat then used bias tape for the armholes and overlocked the whole sideseams from lining through to dress fabric. I also attached just a bit to the zipper, like 5 inches or so. Sorry about my explanation, I'm just a terror at these things, and my terminology is through the roof. Yayz, I'd never thought I'd like pastel colours, but I like this! Very nice! I did my first lining on my birthday dress I made. It was hard but definately felt like a good accomplishment once it was done. Love what you're doing in summer dresses. A little wine (not too much) lubricates the imagination. This is my favorite one so far, I think.